Ragdoll is a somewhat large breed of long-haired cats. It is the most placid and adoring of all felines and is one of the highly prized cat breeds around the world. The beautiful cat dates its origin back to the nineteen sixties when it was first developed in California, United States. Since then it has undergone a few changes but it still remains one of the best varieties among domestic cats as far as temperament and looks are concerned. A relatively big cat, the average Ragdoll weighs in the range of ten to twenty pounds, with males being larger than average females. With its deep chested muscular physique the Ragdoll is an impressive physical specimen amongst house cats. Its long silky coat comes in four patterns, namely mitted, van, bicolor and colorpoint. Established fur colors are six. These include blue, chocolate, cream, lilac, red and seal. Points exist on face, ears, tail and legs like the Siamese, in various patterns including lynx, tortie and solid. 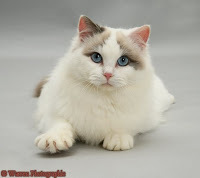 Ragdolls are slow in development and do not reach their full size with a well developed coat until three to four years of age. When fully grown they have a curved profile with large hindquarters. They have big beautiful blue eyes and a very sweet facial expression. Ragdolls are the most laid back of all cats. They almost never get into fights and don't known how to defend themselves. Therefore they must never be left outdoors. It is often reported that they go limp when picked up though this may not be true in all cases. 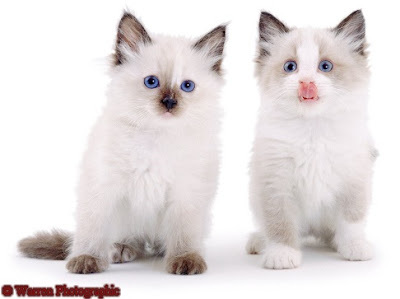 Owing to their loving and sweet nature, Ragdolls make excellent pets for a household. They are playful though they keep their claws sheathed during play. They are gentle and affectionate animals and are also considered often to be the most loving of all cats. They follow their humans around everywhere, displaying a tender attitude towards them. The single layered coat doesn't shed or tangle easily and therefore does not require as through grooming as that of the Persian. 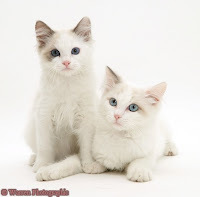 With all these charming attributes, Ragdolls are thus one of the best breeds among cats. Remove the "n" from known and add an "o" to through. You should have someone proof-read this before you post it. my kitty is a mix of a birman and a ragdoll! I bought a 5 month old ragdoll kitten, he was the last one as the person that reserved him decided she did not want him. He is a seal point bi color which is exactly what I wanted. He is an amazing cat, loving but also very independant. He is now 9 months old and already a big boy. I could not have asked for a more beautiful boy. Our Callypso Girl is a year and a half old and so sweet, funny and gorgeous! She is a great playmate for our older non-ragdoll male cat, and we could not be happier with her addition to our family. Locked out of icloud again?! Here use these.